Lynne Rees explores through haiku examples the various reasons to employ line breaks. This essay appears here by permission of the author. 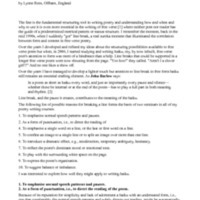 Rees, Lynne, “Going Organic: Line Break in Free Form Haiku,” The Haiku Foundation Digital Library, accessed April 19, 2019, http://www.thehaikufoundation.org/omeka/items/show/650.